Please note that paving of the road to Grand Canyon West is complete. Location & Directions: Grand Canyon West is located in northwest corner of Arizona and can be accessed by car, helicopter and plane. This area of the canyon is privately owned and operated by the Hualapai American Indians. There is entry fee for access. Open/Close & Seasons Summer months are April 1 – Aug 31 and the hours are 7:00 am – 7:00 pm. Last ticket sale is 5:00 pm Winter months are Sep 1 – Mar 31 and the hours are 8:00 am – 6:00 pm. Last ticket sale is 4:00 pm. Entrance Packages & Parking There are several different entrance packages from which to choose and a variety of options to add to a basic package. Grand Canyon West offers free parking because private vehicles are not allowed in the Park; however, there is a complimentary shuttle service that stops at the various viewpoints. Please note the disclaimer on all packages: All tours and products are subject to tribal tax and fees. Weather may affect availability of tours. Grand Canyon West is owned and operated by the Hualapai Tribe and reserves the right to deny entry. Tours and prices subject to change without notice. Cancellation policies apply. No private vehicles allowed at Grand Canyon West beyond the designated parking area. The Legacy Gold Package is the Ticket Price of $82.37 for the Grand Canyon Skywalk. This has caused some confusion over time. You CANNOT just buy a Ticket to the Grand Canyon Skywalk ONLY. You MUST buy the Legacy Gold Package OR Legacy VIP Package to enter the Skywalk -OR- it MUST be included in the Tour you book from Las Vegas. Meal at viewpoint of your choice. Grand Canyon West Viewpoints Eagle Point Viewpoint Native American Village: walking tour of authentic Native American dwellings depicting multiple tribes Amphitheater: live Native American performances from multiple tribes demonstrated continuously all day Creations by Native Hands: featuring handmade, authentic Native American jewelry and crafts Guano Point “Highpoint Hike”: offering breathtaking panoramic canyon views of the Grand Canyon and Colorado River. Visit the remnants of a historic tram that stretched 8,800 feet across the canyon to a guano mine discovered in the 1930’s. Hualapai Market: interact with Tribal members offering Native American jewelry and crafts. Hualapai Ranch Enjoy western hospitality, cowboy entertainment, wagon rides and more. Learn how to rope and quick draw the cowboy way. We would like to see the Skywalk. 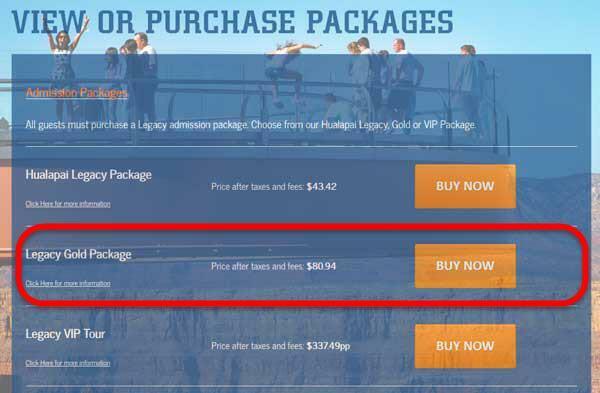 It appears that the Legacy Gold Package – $80.94 per person, includes taxes and fees would be the option for this. Do we need a reservation for this? We would probably arrive around 4-5PM today. Since Grand Canyon West quits selling tickets at 5:30pm and pretty much closes by 7 it wouldn’t be worth your time to go there today! As for the Native American performances, those have been happening with consistency, but can never be guaranteed. Given that you are going in September there is a very high likelihood that you will enjoy a Native American performance. Thank you for your question and enjoy your visit to Grand Canyon West and the Skywalk! are dogs allowed in any of the areas? what pet options do you have? Unfortunately, Only Service Animals are allowed past the Hualapai Visitor Center at Grand Canyon West to go to Guano Point or Eagle Point. However, there is a Kennel Service offered at the Hualapai Ranch for $16/Per Pet Per Day (2014 Prices) available to you, as well. Is there a place that I can park a rv by the west rim? I am thinking about taking a little break this weekend. Today is 10/5/14. Thanks ! Meadview, AZ would likely be the closest location to the west rim where you could find a RV Park. Hi! Will it be a problem f we take our electronic wheelchair. My daughter and I would like to come and visit the Skywalk with the Legacy Gold package. Do I need to make a reservation for this? We would plan on being there either tomorrow or Friday. If so, when is the recommended length of time to plan on being there, between parking, travel to the west rim and touring the Skywalk? You should probably plan for at least 5 hours travel time between Las Vegas and the Skywalk. You will likely want to spend at least 3 or 4 hours there to cover all the view areas and things to do. Take more time if you have it. You say 5 hours – I though it was between 2 and 2 1/2 hours? You are correct. At the time I wrote the post the road had not been completely paved so it should have said 3 hours but now it is an average of 2 1/2 hours drive time from Las Vegas to Grand Canyon West. Do I need a reservation for the Legacy Gold Package if I am coming tomorrow morning? What is the general wait time form the skywalk? You should be able to get the package just by driving there. Was looking at pricing and is there any way just to do the Skywalk and not purchase all the other stuff in the package? You must purchase one of the Skywalk Packages upon arrival at the Grand Canyon West Tour Center located at the Grand Canyon West Airport. Google Maps link: https://goo.gl/maps/TZXm9 They do include your Entrance Fee’s to the Hualapai Nation. They are Per Person and NOT Per Vehicle like Grand Canyon National Park. its it better to drive there from vegas or take the tour bus. thank you. That’s entirely up to you…some people prefer to let other do all the Navigation. Some like to take control of their own destiny. Then see what you think. The Road is completely paved all the way out there now…so many people are choosing to drive out there on their own now. What meal options are we talking about? Are ther any vegeterian options?? The Vegetarian options are all at Eagle Point where the Skywalk is located. Thank you for posting this!!! We are planning a trip and have a 6 yr old and you posting what they have has helped us a lot!! Thank you!! Which of the four rims of the grand canyon is the most popular? and why? It’s the views in photo’s you’ve seen over time at the widest and deepest point of the Grand Canyon. It’s what you are expecting. Grand Canyon Village: El Tovar, Bright Angel Lodge, Kolb Studio, Lookout Studio, Bright Angel Trail and Mather Point highlights. It gets the most visitation at about 3.5 to 4+ Million Visitors annually. You have the ability to get to the Bottom via Helicopter here. It’s the closest Rim to Las Vegas…where the largest Group of Visitors that go to Grand Canyon depart from. It gets the 2nd most visitation at just about 1 Million Visitors annually now. It gets Grand Canyon visitors who are leaving the South Rim and transitioning to the North Rim, Zion National Park, Bryce Canyon National Park and Monument Valley. It’s the most seasonal and remote Rim to access. North Rim is open from May 15th through October 15th Annually. It has great views with Pt. Imperial, Cape Royal and Bright Angel Point in front of the North Rim Lodge. It gets about 800,000 Visitors annually now. Bar Ten Ranch is a newer attraction on the North Rim that is primarily accessible by Airplane Only. Thank you for your Question. I will be putting this to Video soon! I have a question about what package to take. Me amd my family would arrive to GC West late afternoon. We would like to stay the night in a cabin at the ranch and visit the skywalk in the morning. Of course we would like to se the suset the previous evening as well. As our stay would be spread over 2 days I wonder if we need to pay a ticket for each day beside the lodging. Can we bring the Dog to Skywalk? the shuttle? etc ? 2. Are pets Allowed at Grand Canyon West? Answer: Pets are not permitted on tours or allowed to be left in parked cars. Pet accommodations are available at the Hualapai Ranch (fee applies). Service animals are permitted on tours. I hope this helps as you plan you visit to the Skywalk. I have a question regarding the meal option Legacy Gold Package. I am travelling to Grand Canyon West rim with my family on 6th Sep’15 from Las Vegas. I need to know what all Pure Vegetarian options are available out there. We don’t eat chicken, meat, sausages etc. We are pure vegetarians and need to know the vegetarian options which can be available and on which point. I hope this helps you on your visit to Grand Canyon West in September. Before our trip to the Grand Canyon West Skywalk, I read a lot of negative comments but still decided to go to find out for myself. Wow, I’m so glad I didn’t pay attention to all the negative comments because we had a Fantastic time, Awesome sights, great photo opportunities, all the employees were wonderful and very helpful when needed directions. The folks driving the buses were so helpful. So so glad I went and will remember all the sites thru my photos taken there. The Skywalk was Breath-taking, only one thing, I wished I could have been able to take pictures while on there but I understand the reason for ‘No Personal Items’ on the Skywalk. Thank you again for a great time !!! Parking is Free and included when you go to Grand Canyon West. You enter the Welcome Center and purchase your package and then the Shuttle System takes you to the Hualapai Ranch, Guano Point and Eagle Point where the Grand Canyon Skywalk is located. We drove a rental car to the Skywalk. The view and sights were awesome. One word of caution: We drove back down Pierce Ferry road in the dark. There are free range Cows in the area and they are active day and night. Because of the dips in the road, my high beams did not illuminate the cows that were crossing the road. I hit several large cows at 45 mph demolishing the front and side of my toyota. We were shaken but not hurt. Fortunately, a family stopped to help and accompanied us to the Wishing Well Saloon and Restaurant in Dolan Springs where we waited for the sheriff and a new car to be brought from Las Vegas. All the people involved were very nice and warned us the hitting cows is a very common occurrance. Be careful. It took 4 hours to have the car delivered by Thrifty rentals. We are thinking of stopping at the Grand Canyon West on our way to the Grand Canyon South with our 5th wheel, do they have RV parking there. The Parking lot is huge at the Grand Canyon West Welcome Center. When you get there, most likely there will 5-20 Motorcoaches parked there, as well. RV’s, 5th Wheels and more can be easily accommodated at the Grand Canyon West parking lot. Hello, we are planning a family trip to Las Vegas and have two kids (2 and 3 yrs at time of travel). We will three adults. Can we fly there from Las Vegas (helicopter? plane?). We would like to see the West Rim and the South Rim, but foremost the skywalk. Which tour would you recommend? We do not want to stay overnight. Are the kids generally allowed on the skywalk? Thanks. Children are allowed on the Skywalk. This is all great information. I’m look for some combination of self-driving, Skywalk, and helicopter or plane view. One of the links on this website had a plane tour, but if I am understanding it correctly, it does not include the Skywalk? Are these coaches mentioned the same as the regular coaches one would take if they just drove there? If leaving from Las Vegas, it is 2.5 hrs, and $80.94 admission, which includes lunch, and any other ‘hidden’ fees or additional costs? If you are Self-Driving, then the $80.94 per person is the Complete Cost (no other hidden fee’s…except what you might spend in the Gift Shop!) to enter Grand Canyon West, enjoy the Skywalk, and also includes a Meal at a viewpoint of your choosing: Guano Point, Eagle Point, or the Hualapai Ranch. I would also recommend you take a look at the “Over The Edge Helicopter & Boat Tour” by Helicopter that begins at Grand Canyon West, as well. Hi, Are there any hiking trails at the West Rim to which visitors have access? If so, where may I find information on those trails? Thank you. Currently, there are NO approved hiking trails at Grand Canyon West on the Hualapai Tribal Lands. The hiking you are able to do at Grand Canyon West is at Guano Point out to the point where you can view the Grand Canyon. It’s not that far by hiking standards. There is hiking on the Havasupai Tribal lands down to the beautiful blue green waterfalls of Havasu Falls, Mooney Falls and more. Is it possible to bring your own food and eat outside? Can we bring our own wine to have with our picnic? You can bring your own food, however, it MUST be consumed before you board the Motorcoach and take the Tour out to the Viewpoints at Grand Canyon West…Guano Point, Eagle Point where the Skywalk is, and the Hualapai Ranch. Once you board the Motorcoach out to the Viewpoints, you must purchase food at Guano Point, Eagle Point, or the Hualapai Ranch if you simply take the Legacy Package. The Legacy Gold Package includes a meal at Guano Point, Eagle Point, or the Hualapai Ranch based upon your choice. Also, just a reminder…ALMOST all Native American Tribes do not allow the consumption of Alcohol on Tribal Lands. We’ve rented a car from Vegas to come and visit the West rim at the end of March. If we pre book our package will we avoid a queue for tickets? Or is it all the same queue to get into the park? And I just wanted to check that you are open on Easter Sunday (3/27/16)? ONLINE GUESTS PLEASE NOTE: For mistakes or cancelations you must contact us immediately with your confirmation information. After 72 hours we will not allow a refund. We will also not allow a refund due to weather, please contact our office prior to arrival to check on the weather. Online tickets are valid for 1 year. So, to save yourself any hassles with Weather Cancellation or Refunds. I would recommend that you purchase your Ticket when you arrive…it doesn’t really save any time booking Online and you have the risk of a Weather Cancellation to which there is NO Refund for Tickets purchased Online. We are visiting the West Rim in April using the Las Vegas Power Pass which I believe is the Legacy Package. Are we able to pay the difference and upgrade to the Gold to include a meal and the skywalk when we arrive. If so how much will it be please? You should be able to do that. To be sure you will want to contact the tribe directly: https://www.grandcanyonwest.com/contact.html They can tell you what the price will be. 1) An article I read, without a publication date, indicates that the last 9 miles of the journey to Grand Canyon West (since we are driving our own vehicle) is an unpaved road. I have seen information on this site that indicates at this point, the road(s) to Grand Canyon West is now completely paved. Can you please verify this information? 2) We are going to be visiting on March 19th and have purchased the package that includes the Skywalk. There is indication that while we are not allowed to take personal items onto the Skywalk, professional photos can be purchased. First, how would I find out the cost to purchase said professional photos, and second, are they digital prints that we will take home immediately or will we have to order and have them shipped to us? If the photos must be ordered and shipped, is there an additional charge? In either case, is sales tax added to price you are quoting, and if so, please include the percentage. 3) Given that our package includes a choice of BBQ, Chinese, or a sandwich meal, are there indoor/covered areas at the viewpoints to eat? 4) Once parked, how long on average will it take for us to obtain admission and board a shuttle since we have prepurchased our tickets? 5) The indication when purchasing the tickets is that the shuttle service included in our packages is a “hop on, hop off” shuttle. Does this mean when we arrive at a given viewpoint, we get off, spend as long as we want there, then board the next arriving shuttle to the next viewpoint? Or will we be required to follow a predetermined and set tour schedule? Thank you in advance for your answers and assistance. As you may be able to tell, I am a meticulous planner and my family would prefer to be as fully informed as possible to help prevent any potentially unpleasant surprises. I look forward to hearing back from you. 1) Yes, the Road to Grand Canyon West has been COMPLETELY Paved now. It’s beautiful and smooth compared to the dirt road it once was. You will enjoy the drive through the Joshua Tree’s when you go. They have the right to change prices at any time. 3) There are covered area’s at Eagle Point/Skywalk and at Guano Point. If you eat the Hualapai Ranch, it is completely indoors. 4) Unfortunately, this ALL depends on when you arrive that day. If you arrive when the 2,000-3,000 other people arrive daily between 10-11AM, it might take you awhile. Normally, I would say just 30 minutes or less…but that’s given that you don’t arrive when the rest of the Visitors from Vegas arrive in the 10-11AM time period…it’s multiple motorcoach loads arriving near the same time, by the way. 5) You read that correctly. It is Hop On, Hop Off…you take as much time at each point as you’d like. Normally, people go to Eagle Point/Skywalk first, then Guano Point, then to the Hualapai Ranch. A normal visit is 3-4 hours…but again, you can spend as much, as little time at each point as interests you. Remember this is Grand Canyon West…it’s still remote. Remember to stay hydrated and protect yourself from the sun. Season depending…a light jacket might be welcomed, as well. Las Vegas is at about 2,000 feet and Grand Canyon West is at 4,000 feet…so it is cooler at Grand Canyon West. I hope this help you in your Planning. We are planning to do the “over the edge helicopter”, which includes west rim entrance fee but not the skywalk entrance fee. I am wondering, if we can purchase the skywalk fee at the site, as an additional / upgrade. Yes, you can simply add the Skywalk onto the Over The Edge Helicopter tour when you get to Grand Canyon West for an Additional $35 Per Person. Hello, I saw on another page that entrance fee will be free on april 16-24, does that include the west rim? And if i want the skywalk i would just pay $35? Thank you! Grand Canyon West is on Hualapai Tribal Lands and does NOT enjoy Fee Free Entry on that week. If you are looking to do the Skywalk, the fee is $80.94 inclusive for the Legacy Gold Package that includes the Skywalk, a meal, Grand Canyon West Entrance Fee’s. Included in those Fee’s is a shuttle system that takes you to Eagle Point where the Skywalk is, Guano Point, and the Hualapai Ranch. I recommend you purchase your package when you arrive at Grand Canyon West. I hear from my friends who visited the SkyWalk last year in June, that you can go onto it, but it does not allow you to sue camera on it, and it is very crowded, you cannot do anything on it but squeeze thru the crowd. Is it all the time like that? I remember they said the price per person is over $100, are you sure that the price $80.94 includes the ticket for the SkyWalk, right? 1-You are correct, you CANNOT use your camera or cell phone on the Skywalk. Those are stored in a locker while you are on the Skywalk. 2-It does depend on the time of Year…and Time of Day that you visit the Skywalk as to how busy it is. I will let you know that once Season begins when all the Motorcoaches from Las Vegas arrive…usually between 10-11AM Daily…it WILL be busy on the Skywalk until 2-3pm. Earlier or Later in the day will give you a different experience. However, if you purchase one of their photo packages that they offer of taking your picture on the Skywalk…it will end up being more than $100 per Person. Yes, it is doable, however, Grand Canyon West is open from 7am to 7pm daily. They are open every day of the year including all major holidays. Last ticket is sold at 4:30PM from November to March. Thank you Sooooooo much for your time and detailed explanation. Now I know when to go to avoid the crowd, and I guess it’s even better to go in late afternoon for the photo-taking at sunset, and it’s perfect for a day trip from Vegas for spending that time frame 4pm-7pm if the weather is good. I was not able to decide to go before I asked you, now I can decide! THANK YOU !!! You are as famous as the Grand Canyon!!! 1) Is there any advantage ( e.g. price-wise) to book the tickets online rather than buying them in the visitor center? 2) Do you offer wheelchair service for the elderly? Is there a cost, if you do? There is no advantage to purchasing your tickets online rather than buying them when you get to Grand Canyon West. Concerning wheelchairs you will need to contact the tribe directly: For any questions or to inquire about childrens rates, please call 1-888-868-9378 or 928-769-2636. Photos can be purchased singly or in a package. The latest information I have about the photos is that they cost $35 per single and $105 per package. That is subject to change. Be sure to get your pictures while you are there because it is much more difficult to get them if you wait until you get back home. I’m a little confused – planning a trip with the family later this month to the West Rim. Where do I actually purchase the tickets? Looking at the Legacy package. Can I purchase them in advance online or do I purchase them upon arriving? Do tickets tend to run out for any given day? You can purchase the tickets online or wait until you get to Grand Canyon West. You will be able to get them up until 1 1/2 hours prior to their closing time. The travel time is too confusing. When I check the distance between Las Vegas and 5001 Diamond Bar Rd, Peach Springs, AZ • 86434, it says 4 hours 18 mins. When I check distance between Las Vegas and Grand Canyon West Airport, it says 2 hours 12 mins. Which is the correct address to visit the Sky walk ? Can someone please help ? I’m coming by car. The travel time between Las Vegas and Grand Canyon West is about 2.5 hours. I am relocating from California to Virginia and wanted to visit the Grand Canyon West. I will be traveling with my dogs and just called the Hualapai Ranch to find about boarding them for the day I go out. I was told there is no kennel, even for hotel guests. Did the kennel close, or is the one mentioned above a different place? Do you have contact information. Thank you. To my knowledge there has never been a kennel at the West Rim. There is a kennel at the South Rim and a kennel in Williams, AZ for people going to the South Rim. There are pet boarding options in Kingman but that is the closest to the West Rim that I am aware of. We are visiting the West Rim at the end of July through Vegas. We are still deciding on whether to drive to the West rim ourselves verses taking a tour. We are a family of 4, 2 adults and 2 children, 6 & 10 yrs old. Any opinion on that? The roads I know are all paved. My son is in 4th grade currently and is participationg in the Every Kid in the Park campaign for the 100th yr celebration of National Parks. It allows him and our family to visit National Parks for free until the end of August. Do you know if the West rim entrance/package honors Every kid in the park? The West Rim is Hualapai Tribal Land so it doesn’t honor any of the National Park passes. You can go to the South Rim or the North Rim and they will honor it. As far as taking a tour versus driving there, that depends on whether you want to rent a car or just let someone else do the driving or if you prefer to see it from the air. Hoping to visit GC West rim in a few weeks. Driving there from Vegas. Not interested in doing Skywalk, just want to wander around for a couple of hours and take in the sights at the 3 viewpoints. Are there any costs in just doing this ? We are a family of 5 (2 adults, 3 kids) who are planning on visiting the Grand Canyon West Rim on the 25th of September this year. We will have a hire car so were planning on driving ourselves. I think we would be getting the Legacy Gold package so that we can enjoy the Skywalk as well, I’m just wondering if we added the additional helicopter / boat road through either Over the Edge or the Grand Canyon West site, how long would we need to allocate to being at the West Rim? Given that we would want to do the hop on hop off bus ride as well. Also, if the weather is bad and the helicopter ride doesn’t go ahead, am I right in reading that we won’t get any kind of refund? I’m just wondering if this is something we could book there on the day, or do they sell out (especially as there is 5 of us)? Secondly, do you know if there are any Gluten Free options? One of my children is coeliac and needs to eat gluten free foods. I saw that we can take food in, but only so far and I wouldn’t want to be eating our meal and he can’t eat with us. Thank you so much for your detailed site and information. It’s made our holiday planning so much easier. If you add the Over the Edge tour on our website and the helicopter can’t fly that day you would be able to get a refund. If you wait until you get there you might be able to do the add-on but you might also have to wait a while before they will have space for you. In the case of needing gluten-free you should bring that with you -just the food for your child who needs it and explain to them that he/she has a special diet. Because gluten is such a sensitive issue you need to be guaranteed the food is gluten-free and that would be difficult in that remote location. We hope to visit the West Rim in two weeks. We will be purchasing the cheapest package as we can’t stomach the skywalk. We’d hoped to come back the next day and do the horseback riding. Do we have to purchase yet another legacy package in order to gain entry or will we be able to show up the second day and only purchase the horseback riding? Yes, you do have to pay the Daily Entrance Fee again the next day. It is a Daily Entrance Fee at Grand Canyon West on the Hualapai Nation’s land. Hi, we are driving to grand canyon west from vegas because not all of us want to do a helicopter. Is it possible to book a helicopter tour that starts from the grand canyon west area? Yes, you can do the Over The Edge Helicopter tour at Grand Canyon West. Hi there, this is Carol Ann with Adventure Concierge Travel Services. We are located on Pierce Ferry Rd. @ Mile Marker #8 in Dolan Springs, next to the Pink Church. On way to or from West Rim, stop for your Free Maps & Information. GPS does not work out here, so good to grab a Map. It is a nice cool place to stop before continuing on . If driving on your own, be sure you have plenty of water for your journey. We provide Water, Drinks, Snacks & Ice Cream. Our Dream Catcher Souvenir Shop offers many unique choices. Hope you plan a Great Adventure. Don’t hesitate to contact us for further information! See you soon! Thank you for this information. This can make a huge difference to those who are interested in driving to Grand Canyon West. Yes, it does. Good for travelers to know that there is a Rest Stop on way up. Also nice for those on the return trip when so very dark out here, they see the Beacon for Travel Help. Please confirm if the GPS address to visit the West Rim is 5001 Diamond Bar Road, Peach Springs, AZ 86434 ? Do we have any fees for kids less than 3 years old and can we bring the stroller? Is there any fee for the locker to keep the phones and camera during Skywalk? That is generally the best GPS address, however you should consult a map for directions prior to driving. For the fees you need to contact the Hualapai Tribe directly. Their web address is https://grandcanyonwest.com/contact.html The fee for the locker is included in your entrance package. CAN YOU TAKE UR CAMERA WITH YOU AT GUANO POINT AND TAKE YOUR OWN PHOTOS? It’s ONLY on the Skywalk at Grand Canyon West that you CANNOT take your own Photo’s. Hi, what is the best and closest place to las vegas that we can view the GC without paying fees, as couple of us have already done the south rim. You won’t be able to view any of the Grand Canyon without paying an entrance fee. The only place you can go to get any views without paying would be to Horseshoe Bend on the east rim of the Canyon. This isn’t in the Grand Canyon but is in Glen Canyon – the canyon just before the Grand Canyon on the Colorado River. You can currently hike to Horseshoe Bend without paying a fee. We will be visiting the west rim as we drive from Vegas to Phoenix mid Oct. How much time should a person plan on visiting for. Our mom has mobility issues, so we would be just doing a basic visit so that we can say we saw GC. Also are walkers allowed on the skywalk ? The optimal visit time to Grand Canyon West is 3-4 hours. You purchase your Entrance Ticket and Tour Package…then enjoy a Shuttle System that will take you to Guano Point, Eagle Point where the Skywalk is, and the Hualapai Ranch on your Tour Package. Also, walkers and wheelchairs are allowed on the Skywalk when you visit. Yes, you can just go to the 3 view points on the Rim at Grand Canyon West on the Shuttle System by purchasing the Hualapai Legacy ticket for $49.92 per Adult including Tax for 2016. This includes Parking at Grand Canyon West, as well. Where does the shuttle stop? Is this the transportation to the skywalk? Are views of the canyon included in this ride? 1-Eagle Point where the Skywalk is located and a Restaurant. 2-Guano Point where you have a great view into the Grand Canyon and a Restaurant. 3-Hualapai Ranch where Western Activities are located with a Restaurant. There are some views of the Grand Canyon along the Shuttle Route, however, most of the views are at Eagle and Guano Points. I understand that we are not allowed to take our very own photos with cameras or cell phones on the Skywalk however curious about the other sights? . Are we able to take pictures from the other two view points with our cell phone or camera? Yes, you can use your Camera’s and Cell Phones from all around the Skywalk at Eagle Point, all around Guano Point, and at the Hualapai Ranch. You just CAN’T use them ON the Skywalk. I will stay in Las Vegas, I would like to know if I can arrive to the Skywalk in a rental car. There is paved road? its secure? The road from Las Vegas to the Skywalk is paved and there is a secure place to park at Grand Canyon West. I see in other websites that you cannot arrive to the Skywalk in your own car, and you should pay a bus, it is correct? Also in Google maps says that its a private road, there are tolls or some related to pay to arrive to Skywalk? You can drive to the Skywalk in your own vehicle. If you follow the signs and stay on the correct roads you will not be on a private road or have to pay any tolls. Is there an airport-like check of bags at arrival where bottles of water and food have to be thrown away? If we want to buy some meals apart from what is in the pre-paid package, are there food shops at the shuttle bus stops? You ONLY go through Security before going out onto the Skywalk. You place your personal items including ALL Camera’s in your Individual Storage Locker. After you get off of the Skywalk you can then retrieve your Personal Items. As for Meals, Yes, there is a Restaurant at each stop at Grand Canyon West – Eagle Point stop, Guano Point stop, and Hualapai Ranch stop all have Restaurants for Meals. If we buy the legacy package, can we walk up and buy food at one of the three locations? is it possible to drive to Grand Canyon at night? We would like to see the sun rise. You will not be able to drive to Grand Canyon West at night but you can drive to the South Rim of the National Park. Are there entrance fees if you are an enrolled member of a Native American tribe? I was told that since I am an enrolled member of a tribe, I will not have to pay entrance fees? This includes the Shuttle that takes you to the Hualapai Ranch, Eagle Point (where the Skywalk is located), and Guano Point at Grand Canyon West. That’s the challenge…the Sunset photo’s you are expecting…are at the South Rim. Grand Canyon West has a little bit of brilliant color Sunset surprise…however, it’s not the deep gorge you are expecting like at the South Rim. I’ve watched Sunset in the winter when the Sun goes down much earlier…that’s how I know. Unfortunately, for the Sunset photo’s you are wanting…I recommend the South Rim. You’d need to contact the Vegas Power Plus Card company. I suspect they include the Legacy Tour for those who plan to drive their own vehicle or a rental out there. All of the Motorcoach Operations I am aware of ONLY sell in packages…because it’s the only reason you’d go to Grand Canyon West is to tour on the Havasupai Nation’s land WHICH REQUIRES a Legacy Tour or more entrance fee. What is the weight limit on the helicopter tour? Helicopters and airplanes have a maximum weight capacity as well as other restrictions on that govern the balance of the aircraft and help to ensure the safety of all our guests. Occasionally, to satisfy these safety requirements it may be necessary to split your group across more than 1 aircraft. All helicopter or airplane passengers will be weighed at time of check in. Passengers weighing 300lbs (136.36kg / 21.43 stone) or more will be charged a fee for an additional comfort seat. This fee is based on the product and ranges from $50 to $200. Are handguns permitted on the tour. I am a police officer and will be doing a cross country trip while carrying. I don’t want to leave it in the car but want to make sure I am allowed to put it in a locker if allowed. Thanks. You should call the Grand Canyon West Reservation Line: 888-868-WEST or 928-769-2636 to ask about your Handgun. Can I visit only Eagle Point by my car without fees? And what’s about Guano and Quartermaster Points, I have the same option to drive there or I have to buy something? The way Grand Canyon West is setup you must purchase one of their Tour Packages to visit ANY of the Points at Grand Canyon West. You do not have the option to drive your own vehicle to any of the points there. Is the skywalk open in December? Do I need to buy a ticket for 2.5 yrs old girl ? Grand Canyon West Charges for Ages 3 and up. The current price for JUST admission is $40.44 for ages 3 – 11. Do you have any additional information about accessibility at the 3 sites? Are there ramps and walkways? How about the shuttle? Is it easily accessible for someone with mobility issues (non-wheelchair)? Do I understand correctly that no cameras are allowed? That is correct. The Grand Canyon Resort Corporation will have photographers on the Skywalk who can take a picture of you which is then available for purchase after you depart the Skywalk. do we need to purchase tickets for a 2 years old infant to visit grand canyon skywalk/other packages? Or even to enter the grand canyon west? Children ages 3 and above will need to pay to visit the Grand Canyon Skywalk or other Packages they offer. A 2 year old infant does not pay for Entrance to Grand Canyon West. Hello, we are planning to visit the grand canyon on July (around 10 to 15 dates. Will the skywalk will be open that time? And may I know what is the updated price for the legacy gold packages. Yes, the Grand Canyon Skywalk will be open from July 10-15th! Here is the Current Legacy Gold Package pricing of $72.60 Per Person. Why is the admission time only has 7am and can’t choose other time like 10am. When you book online, that is the Time that they Open, so you can come whenever you want to that day. It’s not necessary to choose a Specific Time to be at Grand Canyon West. The Average Visit is 3 1/2 hours…so plan enough time before Closing to allow you to get to Eagle Point and walk on the Skywalk, go to Guano Point, and see the Hualapai Ranch.